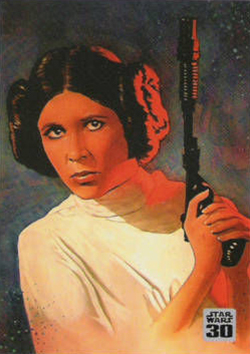 During the first three decades after its release, Topps and Star Wars teamed up for dozens of different sets. 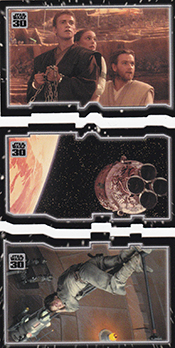 And while cumulatively they covered the saga, the art and just about everything in between, up to that point, none were as comprehensive as 2007 Topps Star Wars 30th Anniversary. An all-encompassing base set, some beautiful sketch cards and a to-die-for autograph checklist have made it one of the, if not the, greatest set of Star Wars trading cards ever made. 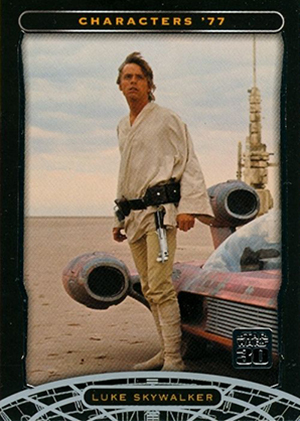 The 2007 Topps Star Wars 30th Anniversary base set has 120 cards. Key characters, the six films, behind-the-scenes shenanigans, George Lucas and fan films all make the cut. 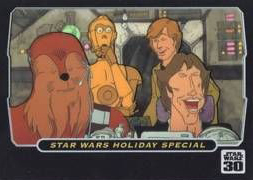 Even the notorious Star Wars Holiday Special gets a mention. Base cards have three levels of parallels. Blue cards land two per box while Reds are one per box. Gold parallels are numbered to 30 copies each. Autograph lineups are often hit or miss in Star Wars products. 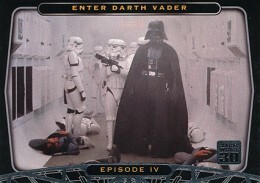 2005 Topps Star Wars 30th Anniversary Autographs (1:43 packs) are a home run then. Not only does it have key actors from past sets like Carrie Fisher (Princess Leia) and Anthony Daniels (C-3PO), it has lots of first-time signers. Composer John Williams leads a set of behind-the-scene signers. 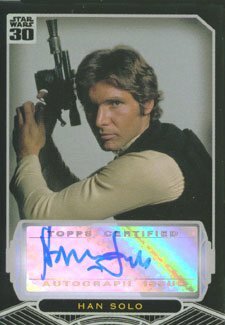 However, the biggest autograph in the set, and possibly any recent trading card set that isn't a cut signature, is that of Harrison Ford (Han Solo). Rumored to be limited to just ten copies, this was the first time Ford signed for a set. At one point, a copy of the card sold for $10,000. Seeing as how Ford has signed for other sets since, it's highly unlikely it will go for that much again but it's still one of the most notable modern autograph cards. Hobby boxes without an autograph come with a sketch card instead. More than 40 artists contributed to the set including Katie Cook, Cat Staggs, Len Bellinger and Joe Corroney. Since the set's release, these sketch cards have become relatively tough to find on the secondary market. 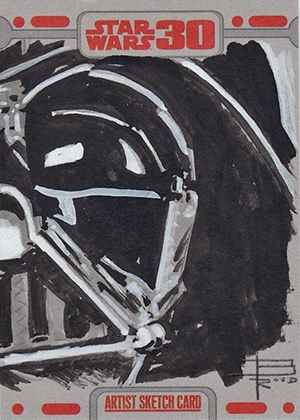 On a whole, the quality is higher than several of the first Star Wars sketch cards. Triptych Puzzle Cards are a series of themed three-card puzzles. Each piece of the three comes from a different film. Retails packs have a pair of exclusive inserts, Magnets (nine cards, 1:8 packs) and Animated Cels (nine cards, 1:6 packs). Blister packs also have one of three exclusive Bonus Cards. 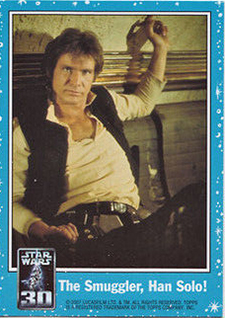 2005 Topps Star Wars 30th Anniversary hobby boxes each come with a box topper, a shrink-wrapped buyback from the original run of cards released in 1977 and 1978. Each is stamped with a gold foil logo. The secondary market responded well to these as several collectors went after sets. Green Series 4 and Orange Series 5 cards command the highest premium. topps CERTIFIED autograph CHRISTINE HEWETT star wars BREA TONNIKA 30th anniv. 2007 TOPPS STAR WARS 30th ANNIVERSARY COMPLETE ANIMATION CEL-CARD SET OF 9 L@@K! 26 "I Love You"…"I Know"
9 cards. Inserted 1:6 retail packs. 3 cards. Inserted 1 per blister pack. 9 cards. Inserted 1:8 retail packs. Cards are not numbered. Darth Vader and Gov. Tarkin Confer. 27 cards. Inserted 1:3 packs. Sets of three fit together to form a small puzzle. Star Wars 30th Anniversary George Roubichek Autograph Card.